When David and Barry approached us in August 2017 looking to define their brand, target audience and implementation of new collateral, including a website, they wanted to introduce a modern, professional and corporate feel to their business to help them to grow. Established in 2015, CatonLloyd is a reliable and local team with highly specialised, technical skills, designing, supplying and installing bespoke audio visual and video conferencing systems for big industry names worldwide. The brand aims to bring people together with their advanced audio visual solutions. CatonLloyd approached us because they felt their branding didn’t represent their values or their ‘why’; their brief website was functional and the business wasn’t communicating the points that make it unique. David and Barry wanted to create a new brand definition and brand visuals, successfully defining and communicating CatonLloyd’s brand and positioning the business so it was ready to be actively marketed. The aim of our proposal was to help CatonLloyd realise its longer-term ambitions as a business, which were thoroughly explored in the early stages of our project. CatonLloyd chose to work with CRE8 because we’re really local to their Leigh-based office, allowing us to regularly meet face-to-face and build a great working relationship. At the outset, Paul and Vicki undertook a period of consultancy with the client: an important phase to the successful delivery of any project! We identified how CatonLloyd had developed, how David and Barry wanted to define themselves, their target audience and what makes CatonLloyd so unique. Together with this, we undertook some competitor analysis which helped us to understand the current market trends of the audio visual solutions industry. The brand name ‘CatonLloyd’ remained the same (with the introduction of a capital ‘L’! ), as the team had already established excellent client relationships, reputation and recognition. This allowed us to start building the brand; Jonathan designed a range of logo concepts, Vicki developed a strapline, and a website brief started to come together as we understood more about CatonLloyd and what David and Barry wanted to achieve with their business. Over several months, the new CatonLloyd brand was developed and implemented. 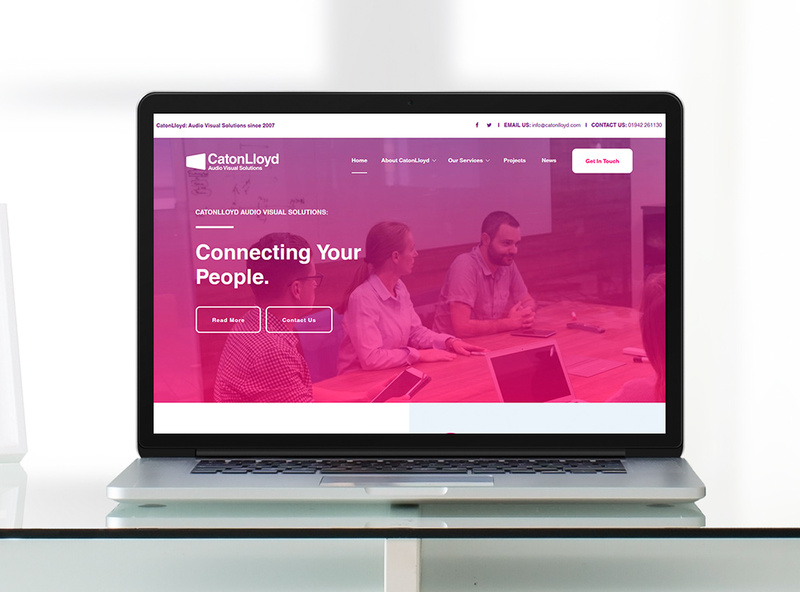 We drafted content for a bespoke website which was designed and built to incorporate our client’s identified brand values and the innovative approach CatonLloyd takes to its work throughout the North West, UK and globally. Following initial launch of the website, CatonLloyd and CRE8 have continued to work together on graphic design to support the client’s sports sponsorship and we’ve established a great professional relationship. Our team is proud of the results we’ve achieved with CatonLloyd, and it’s been great for us to see how the business is growing already, with new premises and more work. 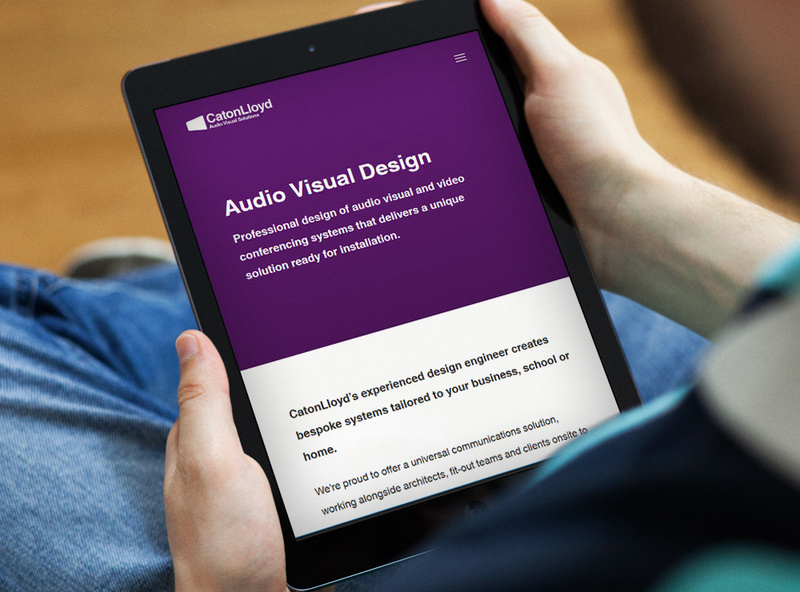 From the brand messages and visuals to the professional new website, the brand is now communicated the way it needs to be to achieve the client’s goals: innovative, corporate and delivering high-end audio visual solutions to ‘connect your people’. CatonLloyd’s professional and modern website incorporates the client’s new brand messages, visuals and brand strapline, communicates CatonLloyd’s brand strengths, uniqueness, and demonstrates quality and range of work to encourage new enquiries.